Services Division, FAS, (202) 447-7103.
specialties, canned fruits and vegetables, pickles, sauces, and salad dressing. if split chickpeas not available. Pack in 50 kg bags. Quote FOB or CIF Singapore. 2049 Soybean oil (Thailand). Wants 500-600 mt of bulk soybean oil, crude degummed. Samalek, Cairo, Egypt. Cable: SYSMULT. Phone: 801476. Bud Schaeffer, IPEC Equities.Corp., 114 East 39th Street, New York, NY 10016. 2054 Malting barley (Spain). Wants 3-4 metric tons of brewers malting barley. duck eggs for hatching: approx. 10,000 and quail eggs for hatching: approx. 7,000. Mexico 7, D. F. Phone: 5-11-83-73. Hannover 1, Germany. Phone: 0511-15993.
variety meats. Quote CIF Rotterdam. Bank ref: Slavenburg's Bank, Rotterdam. Netherlands. Telex: 27278. Phone: 010 332500. NR Eindhoven, Netherlands. Phone: 040 519600/519294. barrels. Quote CIF Puerto Barrios or Santo Tomas. Bank ref: Government Agency. Guatemala City, Guatemala. Phone: 312886/321335/316423. Kaspe de Centro America, S.A., 3 Calle "B" 10-76, Zona 7, Guatemala, Guatemala. Telex: 336 KASPE Guatemala. Cable: INCASPE. Phone: 45234 42546. 70/90 mm, preferably in 25 kilo bags, delivery during winter season 1979/80. ATO D). Phone: 040-34 12 07. No. 10, Caracas, Venezuela Telex: 26415. Phone: 81.11.03 & 81.58.69. Cho, Shiga, Japan. Cable: OHARA, KOGA SHIGA. Phone: (074888) 4016. Ltd., 4-5, 6-Chome, Minami-Aoyama, Minato-Ku, Tokyo, Japan. Telex: 265-5720. Cable: SOLARNATION TOKYO. Phone: 407-0254.
purity and germination,the firm works on a one percent commission payable by seller. H. E. Hanslow Pty. Ltd., P.O. Box 621, Dubbo New South Wales 2830, Australia. Standard Bank, Centre Branch, Johannesburg. Contact: Walter A. Chipkin, Walter A.
Chipkin (Pty) Ltd., P.O. Box 6812, Johannesburg 2000, South Africa. Telex: 84039. United Arab Emirates. Cable: AL HADITHA. Telex: 3387 HADITA AH. Phone: 823992.
for flavoring extracts and flavoring syrups. Quotations: CIF, Hamburg or Bremen. Geschaftsleitung, Riedeka Gmbh, Emil-Kuttler-Str. 3, D-7867 Maulburg, Germany. Office, P.O. Box 1694, Amman, Jordan. Telex: 21416 KAMCO JO. container-loads, fancy, wrapped bunches, delivery November- December. Quote C&F U.K.
GU24 OBX, England. Phone: 048 67 2364. SW8 5NQ, England. Telex: 8814893 HOINIE G. Phone: 01-720 2526. Bogor. Cable: LPTI BOGOR Indonesia. (Preferred form of contact). Phone: 01-253 9013. V/Hotlaveg, 104 Reykjavik, Iceland. Phone: 91-81266. Cable: SISIMP REYKJAVIK. 2087 Joint venture for tomato paste, canned milk, and related canned foods (Nigeria). employs 25. Contact: E. 0. Ani, President, E. 0. Ani Trading Company, c/o S. 0. Ani, Vice President, 1700 Stanton Road, #D28, Atlanta, Georgia 30311, U.S.A.
call only 8:00 AM 1:30 PM., or 9:00 PM 10:00 PM. Morocco. Telex: 72934 M. Phone: (04) 305.27 / 319.21. 360 eggs. Quote C&F Buenos Aires, CIF Buenos Aires. Bank ref: Lloyds Bank. Contact: Horacio Dewey, S.A.P.R.A., Viamonte 1328, Piso 2 Buenos Aires, Argentina. Telex: 22531 NOBLE AR. Cable: SAPRAVE, Buenos Aires. Phone: 45-4316/7 45-9871/4. Costa Rica. Telex: 2414 MEIC. Phone: 22-10-77. Egypt. Telex: 93117 BERZI UN. Phone: 817871. England. Telex: 8952396. Phone: 01-403 1919.
fresh or frozen bluefin tuna. Quotations: C&F Nagoya. Delivery as soon as possible. Suisan Co., Ltd., 3-10-3 Taiho, Atsuta-Ku, Nagoya 456, Japan. Phone: 052-681-2351. C.A. Cable: CAPELLADES. Phone: 420419. Ta Road, Taipei, Taiwan, P.O. Box 74-117 Taipei. Phone: (021 3818391. 3036019. Cable: "CAREER" Taipei. Telex: 25544 ASIANABM. of rice in consumer packages. Requests samples and offers CIF with 3% commission. 18, Port-Louis, Mauritius. Cable: GEWISKO. Phone: 37-550.
guarantee insurance against death. Quote CIF Quito International airport and FOB. Y Ganaderia 1740 Calle Guayaquil, Quito, Ecuador. Telex: MAG 176. Phone: 517-709. Continued export growth forecast for agricultural products. year to about $38 billion and about 16 percent in volume," reported Thomas R.
15.8 billion in fiscal 1979." and the featured speaker is General Policarpo Pax, Chief of State of Honduras. American Conference, International Trade Mart, Suite 2900, New Orleans, La. Staff, FAS, U.S. Department of Agriculture, Washington, D.C. 20250. Coffee Production and Trade in Latin America, FAS M-288, May 1979. 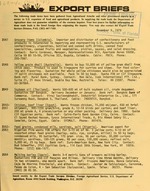 World Grain Situation Outlook for 1979/80, FG-9-79, June 22, 1979. Canned Deciduous Fruit Packs in Southern Hemisphere Up in 1979, FCAN 2-79.